Based at Whissendine Sports Club, the Melton Mowbray and District Model Engineering Society holds monthly meetings for members as well as monthly open days for the public to watch and ride on its engines and locomotives. 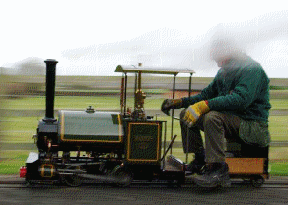 Melton Mowbray and District Model Engineering Society has a permanent track at Whissendine Sports Club for the running of mini passenger carrying trains of 3 1/2″, 5″ and 7 1/4″ gauges. The society not only holds monthly talks for members and monthly steam-ups for the public but it attends local fêtes and fairs and puts on an annual event of the kids of the village school. Members meet at 7.15pm for 7.30pm on the second Monday of each month at Whissendine Sports Club to attend organised talks, films, works in progress and demonstrations. See the schedule of events on the village calendar here or visit the society’s website. New members are always welcome and those interested are encouraged to simply drop in, speak to the organisers and see what goes on. Every third Sunday of the month, members, model enthusiasts and the public can see the engines and locomotives in action at Whissendine Sports Club and can ride them. There are typically about 30 people, old and young, at these monthly steam-ups, with a few engines in steam as well as some diesel locomotives. All are welcome! See the schedule of public events on the village website here.